Learned the true name of a European toad…the kind they have (tis mega-rare) in Edinburgh and a few other parts of the UK. Their official name was changed five minutes ago — while I was writing this blog– to: Epidalea calamita. Chris Hill informs us that there will be a moment of silence for the Great Sheldon Brown and then a foray in search of toads trying to cross a road en route to the other side. Volunteer traffic marshalls will assist the slow traffic as they migrate those last scary meters to their breeding grounds. Know what game these lowland toads fancy? Preferably in the well-marked “Violators WILL Be Toad” traffic zones. 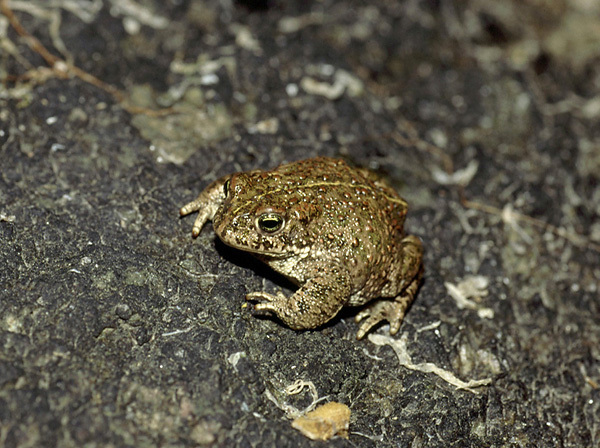 This toad’s niche is in open meadows and shores, where no other toads go…these guys (and gals) scamper rather than hop (this has been attributed to either extra-long or extra short legs in varying websites…such is the internet! )…and sport a natty yellow stripe (now I know we’re related) down its bumpy back…and their call is pretty mesmerizing. About the newly changed name: those folks in academe wait til you’ve memorized the two part Latin name of an organism, then hold a convention to change it…they’ve taken a page from Shimano’s “let nothing remain simple” book. Here’s yet another little concert. ~ by jacquiephelan on April 2, 2008. Glad to see you posting more lately… love reading you. Thanks.